Lumbar interbody fusion is a procedure performed to reconstruct the damaged lumbar spine for several conditions. 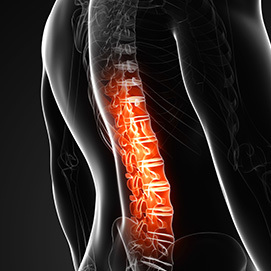 This procedure is commonly performed on patients who experience back pain that is accompanied by weakness, numbness, and pain that travels down the leg. Lumbar interbody fusion may also be performed for mechanical back pain that is caused by a damaged disc or deterioration of the joints. This pain is characterized by pain that occurs with movement, but is somewhat relieved by rest. Lumbar interbody fusion can be thought of as the creation of an internal brace while restoring the structural components of the spine. There are different approaches to this surgery, and the severity of the condition will determine which is recommended. Transforaminal lumbar interbody fusion, or TLIF, is minimally invasive and is performed through a very small incision in the back. Posterior lumbar interbody fusion, or PLIF is a more extensive surgery that alters the structure of the spinal area and is intended for patients who suffer from a severe condition of the low back. This procedure generally requires a longer recovery. After either procedure, however, patients usually experience relief of their symptoms and the ability to return to their normal activities.